The Globe Artichoke - Cynara cardunculus - has for centuries been considered a food that only a true connoisseur’s could enjoy. In fact some of the more flavoursome varieties, such as the Italian cultivar 'Violetto di Chioggia', were for a time only allowed to be eaten by the Italian aristocracy. Although these delicately flavoured flower heads owe their history and cultivation to the Mediterranean regions of Southern Europe, its true origins are believed to have come from North Africa where they are still found in the wild state. Even its name, a derivation of the North Italian dialect word ‘art ciocco’, has its origins in the Arabic name for this plant- al-khars hof. There is a Greek myth which tells us that the first artichoke was a woman of surpassing beauty named Cynara, who lived on the island of Zinari. The God Zeus – who was there visiting his brother Poseidon - fell in love with her and decided to make her a goddess, but Cynara missed her home and mother so much that she would sneak back to earth from Mount Olympus to visit her them. This infuriated Zeus, who in a fit of rage, exacted his retribution by hurling her back to earth, and transforming her into the first artichoke. 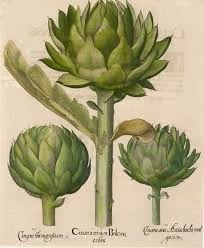 It is from the woman's name Cynara that we now get the botanical name for artichoke. Catherine de Médici, who was married to King Henry II of France at the tender young age of 14, is credited with bringing the artichoke from her native country of Italy to France, where it became a huge and instant success. However, it was the Dutch who introduced artichokes to England, where they were grew in Henry VIII’s garden at Newhall in 1530. Henry became such a fan of the artichoke that records show he eat them in 'generous quantities'. Surprisingly, during the 16th Century, it was considered scandalous for women to eat artichokes. 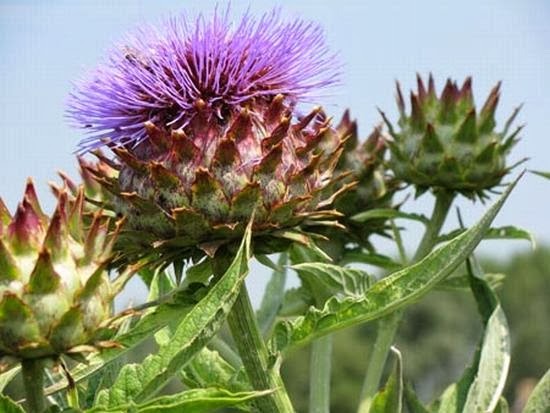 In fact the plant was held in such high regard during this time that- for a while - the artichoke was even denied to women and reserved only for men because of the belief that it could enhance sexual power. From the 16th century to the end of the 20th century, the French were growing artichokes in Paris and it was here that they were raised to gourmet status. Like many of the unusual and rare vegetables available at that time, artichokes were so costly that only the wealthy aristocracy could afford them. However it was the high profits that could be made from growing artichokes that motivated farmers in Italy, Greece and Spain to build up stocks and grow artichokes in large quantities. With the prospect of this gourmet vegetable now being available to the masses, it soon lost its status in France and cultivation here began to diminish. Nowadays, the artichoke is a much more humble crop, easy to grow with many varieties now suitable for the colder regions of Europe. The old cultivars such as 'Violetta di Chioggia', and 'Gros Vert de Laon' are still available today and growing these historic varieties from seed is a relatively easy affair. Obtaining seed is a little more difficult as they are rarely seen in local garden centres. However there is usually plenty of stock available from reputable supplier online. So if you want to step back in time and eat the ‘forbidden fruits’ once only reserved and enjoyed by the European aristocracy why not try and grow some yourself today?